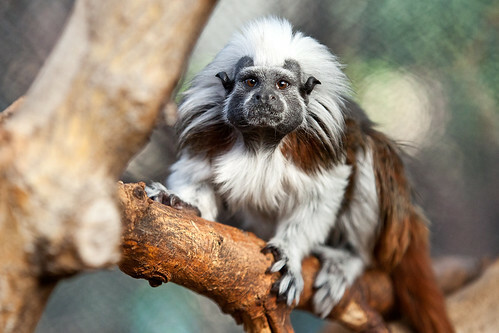 Cotton-top tamarins are named for a tuft of white fur that extends from the top of the head. These small primates have white bodies, arms and legs, with brown backs and a black face. They can reach up to 8 inches in height, with tails extending another 10-11 inches beyond that. 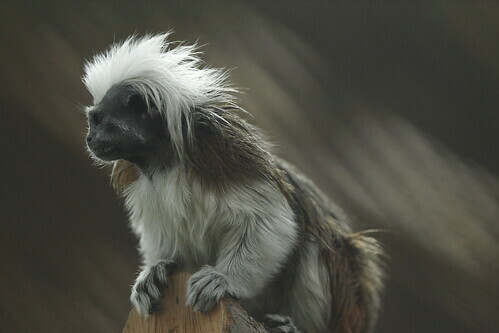 Cotton-top tamarins are native to northwest Colombia. 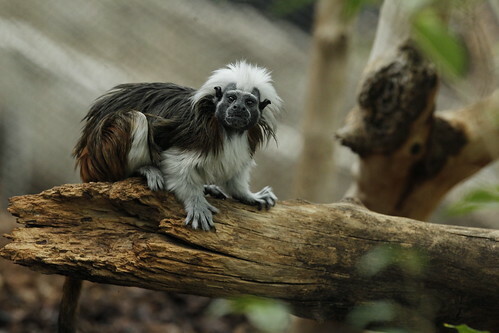 Cotton-top tamarins are endangered in the wild due to habitat loss and the illegal pet trade. 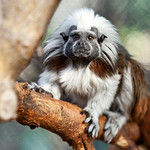 To help conserve the species, Lincoln Park Zoo participates in the Cotton-Top Tamarin Species Survival Plan®. This arboreal species occupies rain forests and open woodlands. Insects, fruits and nectar make up the majority of their diet. The species is also known to feed on gum produced by trees in its rain forest home. 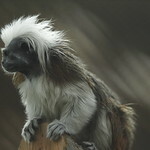 Cotton-top tamarin groups are territorial and will use scent-marking to indicate their turf. Like many tamarin species, cotton-top tamarins give birth to nonidentical twins. The new arrivals can equal 20 percent of the mother's weight! 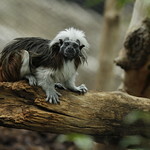 Perhaps because of effort associated with birth, cotton-top tamarin fathers play a big role in the rearing process, carrying new arrivals through the forest. Breeding pairs are monogamous, and offspring often stay with the parental group for a time to help rear younger siblings.